I say this because my Skyline shares a rather challenging problem with most postal vehicles: right-hand drive. This is, of course, unusual in America, because most vehicles are left-hand drive, except for mail trucks, and some imported cars, and the occasional Zamboni. You’d already know one of the challenges of right-hand drive if you followed me on Twitter, because I recently posted a photo of myself going through a drive-thru in reverse. But that’s merely a minor annoyance compared to some of the more serious right-hand drive issues, such as visibility, and lane positioning, and having to explain to people at stoplights that you aren’t British. To help illustrate my point, I’ve created a video that illustrates exactly what it’s like to own a right-hand drive car in a left-hand drive world. But for those of you who are reading this from a video-challenged environment, such as a display iPad in a shopping mall Apple Store while your wife searches for house plants, I’ve also decided to tell you what I think about right-hand drive using the old-fashioned method: blogging on the Internet. So here goes. When I was going through the process of buying my Skyline, I assumed my greatest “right-hand drive challenge” would be making left turns. What I thought would happen every time I needed to make a left turn was, I would have to maneuver my body across the passenger seat and crane my neck like a zoo giraffe trying to eat from a tree in the elephant enclosure. But over the last few months, I’ve discovered there’s actually an even bigger challenge to right-hand drive: lane positioning. Here’s what I mean. When you’ve driven an automobile for a while in a left-hand drive country, you subconsciously train yourself to place the driver’s seat in the left part of the lane. This is not something you think about. It’s just a natural reaction; something you do, like putting on shoes, or brushing your teeth, or waiting to throw stuff away when the trash gets really full in hopes that your wife will empty it. So when you get in a right-hand drive car, you instinctively start to do the very same thing: you place the driver’s seat in the left part of the lane. But this is a terrible idea, because it means roughly half your vehicle is positioned in oncoming traffic. I was especially guilty of doing this on my way back from buying the car. What happened then was, I’d be cruising down the highway in the right lane, attempting to conform to Virginia’s speed limits by driving at approximately the same speed as toothpaste being squeezed out of the tube by an elderly hamster. But then my mind would start to wander, and I would naturally drift over to the left part of the lane. On more than one occasion during my trip home, I realized that I was actually a foot or two into the lane to my left. Imagine being pulled over. I notice other people have this problem too, when I let them drive the Skyline. They’ll be sitting there, in the driver’s seat, with feet of extra space on the driver’s side. And I’ll be sitting there, in the passenger seat, merely inches from oncoming traffic, thinking that if I die in this car, the news article will say I was killed “in a silver 1990 Nissan,” and people will think I was driving a freakin’ Stanza. And then there are turn signals. Oh, the turn signals. Here’s a fun fact: in a right-hand drive car sold in Europe, the turn signals are in the normal configuration. In a right-hand drive car sold in Asia, the turn signals are reversed. I have no idea where the turn signals are in Australia, though I will be sure to ask the kangaroos the next time I’m at the zoo. So anyway: what happens is, you go to make a lane change, or a turn, and you put your signal on, except it isn’t there. Nothing is there. There’s just a giant hole, because the wiper control in the Skyline is on the gauge cluster. And then you remember: Oh yeah! I’m driving the Skyline! So you reach for the signal on the right side of the control stalk, and you put your signal on, and everyone’s happy. Except everyone isn’t happy, because you go to put on the turn signal in your normal car, and you accidentally turn on the wipers. This happens constantly. So constantly that I get the sense I’ll end up having to replace my wipers every few months, since I’m often repeatedly wiping the windshield when it’s completely free of any trace of liquid. Imagine speaking to the mechanic. Now, let’s talk drive-thru. Like many Americans, I have generally stopped going to the kinds of restaurants that have drive-thrus, because what I have learned from the media is that these places primarily serve food with the nutritional value of a brake pad. 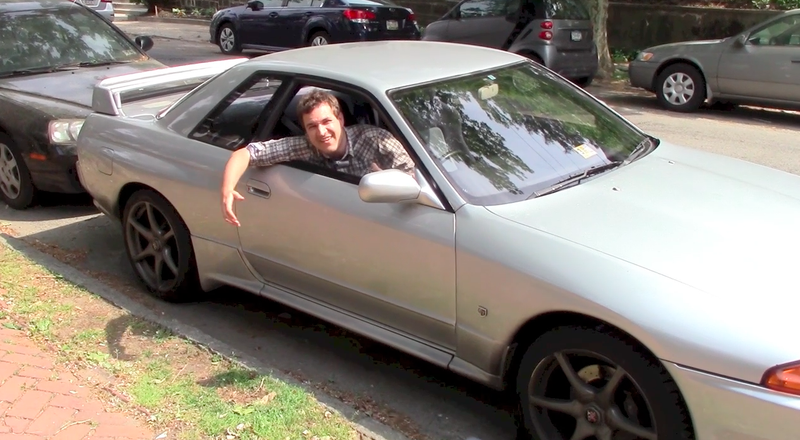 But in the video, I did take the Skyline through a drive-thru, and I discovered that this is no easy task. The reason is shocking: because the steering wheel is on the wrong side of the car. Also, what I discovered is that the drive-thru people won’t really lean out the window and help you, because this is not part of their job description. “Provide hamburger with bun made out of typing paper”? Yes. “Reach out window and deliver food to idiot in high-performance mail vehicle”? No. But then I explained to her why I was in reverse, and she realized what was going on, and she started laughing, and then she took a Snapchat selfie, and then she called some other employees over, and they took Snapchat selfies, and after a while it felt like I was getting the same reception I would’ve received if I had come through the drive-thru riding a zebra. This made things a little uncomfortable, so I decided there will be no more drive-thrus in my future, and I will eat all my upcoming meals at Denny’s, where they make the hamburger buns out of at least cardstock. In America, however, the benefits are slim. But there is one obvious one: parallel parking. In my normal vehicle, parallel parking involves me lining up next to a spot, and reversing into it, and getting my bearings, and making sure I fit, and then smashing into the car behind me and taking off at full speed. But when I’m in the Skyline, I have no trouble with parallel parking. This is because I’m positioned right next to the curb, where I can see everything, including my precious R34 GT-R wheels. So I park the car perfectly, and I get out right on the sidewalk, and then I must spend the next five minutes explaining to onlookers that I am not British. And then they take a Snapchat selfie.